The RS-BA1 allows you to use your ham shack at a distance, whether you are in another room in your home or in another state. As long as you have internet access, you can get on the air. Low latency provides the same operational experience as using an actual radio plus high quality audio over an IP network. Most functions and modes of your transceiver, including interference rejection functions and IF filter settings, can be controlled using CI-V commands. Remote power ON/OFF function wakes up the IC-7600 from standby mode. 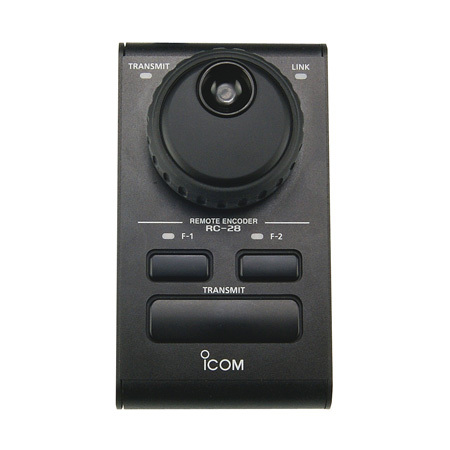 This Icom exclusive software gives you most functions and modes from your Icom transceiver in your ham shack. Several separate windows for CW keyer settings, voice memory, SSB passband settings for both transmit and receive, and filter settings. Slider control or tuning knob control screens are selectable for RF power, CW pitch, RF gain, and SQL and AF level. 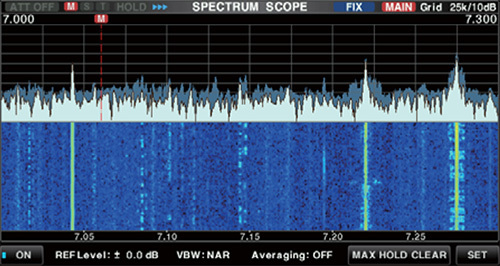 View the spectrum scope with the waterfall function. It provides a high speed, high resolution spectrum scope equivalent to the main unit (For a single band on only the IC-7851, 7850 and 7300). The IC-7851, IC-7850, IC-7800 or IC-7700 has a built-in Network function, so only an Ethernet cable is needed. The IC-9100, IC-7600, IC-7410, IC-7300, IC-7200 or IC-7100 can be connected to a PC with a USB cable and the input/output audio signal and CI-V command is sent through the USB cable. The IC-756PROII/III, IC-746PRO, IC-7400 or IC-7000 can be connected to a PC with an audio cable and RS-232C cable through CT-17 CI-V level converter*. *RS-BA1 operation with the Base station's PC connected to the radio's ACC socket, MIC connector, or S/P DIF jack for audio communication cannot be guaranteed. Depending on your transceiver, some functions or modes cannot be used, or you need to update the transceiver’s firmware. Please use the latest firmware version of the transceiver. 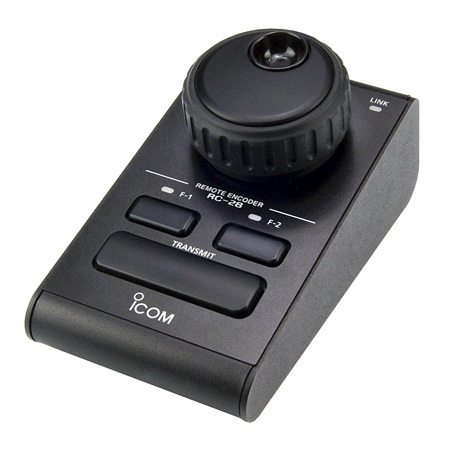 The optional RC-28 utilizes the same tuning knob and encoder used on Icom HF radios, providing a tactile option for the RS-BA1 software. The encoder includes a PTT and two user-programmable function keys. 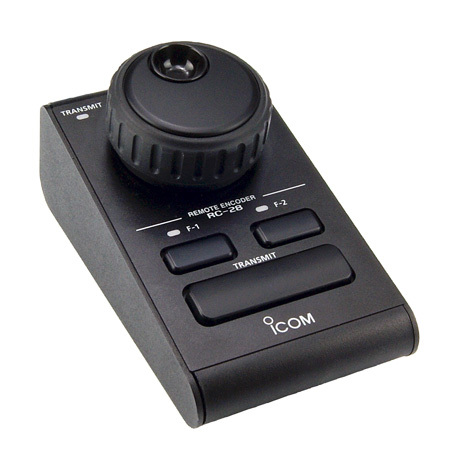 The RC-28 is not a standalone control for Icom radios and may only be used with the RS-BA1 software.